Housing is a Foundation – 2016 PAHRC Report examines the unique position of affordable housing to serve as a springboard to lift families out of poverty. It finds that assisted housing provides a niche resource for low-income children, seniors, and disabled individuals and that families selecting into rental assistance programs often face additional barriers to success beyond poverty, which are greater than those of their low-income unassisted peers. 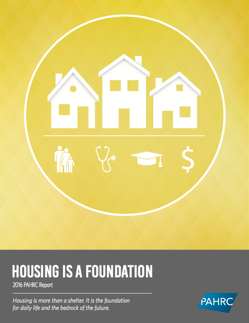 However, the report also empirically demonstrates that housing assistance can help improve stability, financial security, and investments in health and education. At a time when the need for affordable housing is expected to grow even more critical, the report also documents how housing providers and community development stakeholders are creating innovative solutions to pair housing and resident services to strengthen our nation’s affordable housing stock and improve the lives of low-income families.